This year we decided to move a bit further west for our Easter outing and we ended up staying in Torver, just south of Coniston. It turned out to be a very good choice as there are now two good eating pubs and a network of trails around the valley so you don't need to ride on the main road very much. Steve and Judith joined us on the first night and we started a hard fought series of domino games (fives and threes for those in the know) in the little bar in our B&B. Steve and I also managed to finish a wooden puzzle in record time and won free drinks (a never to be repeated offer). We also managed to annoy some Spanish people in a room above the bar by rattling the dominoes too loudly, oops. Mark G and David (a friend of Steve and Judith) joined us on our first day out on Good Friday and we headed north for good riding around Tilberthwaite and Little Langdale. I trashed my knee a few weeks ago on a ski trip so I was having a bit of trouble on the tricky uphill pushing bits, so thanks to Steve for coming to my rescue and dashing back down to get my bike. Despite the amount of snow this winter the trails were in good condition and we headed back on dry trails via Tarn Hows. I suggested climbing up the incredibly steep first section of the Walna Scar road for an extra descent, obviously with my poorly knee I couldn't actually do it myself but I'm assured the climb was as bad as I remembered. Mark R joined us at the Steam Bistro in Coniston for an excellent supper and then it was back to the B&B for more arguing over the dominoes. Breakfast on Saturday became a bit competitive with Mark G opting for the Full English and Steve going one better and ordering the supercharged 'Bring It On' version with added baked beans. We staggered out a bit later to discover another dry day as the forecast morning rain didn't materialise. Alan and I headed off for a walk to give my knee a change of pace, we got halfway up the Old Man in a ferocious north wind and then headed down into Coniston for a cafe stop. Judith, Steve, Mark x 2 and David did a route over into Grizedale and back down Parkamoor that I suggested and finished off on a bridleway we've hardly ever used. We wandered down the bike path into Torver to the pub for supper, very good food and lots of it. Back for more dominoes (obviously). 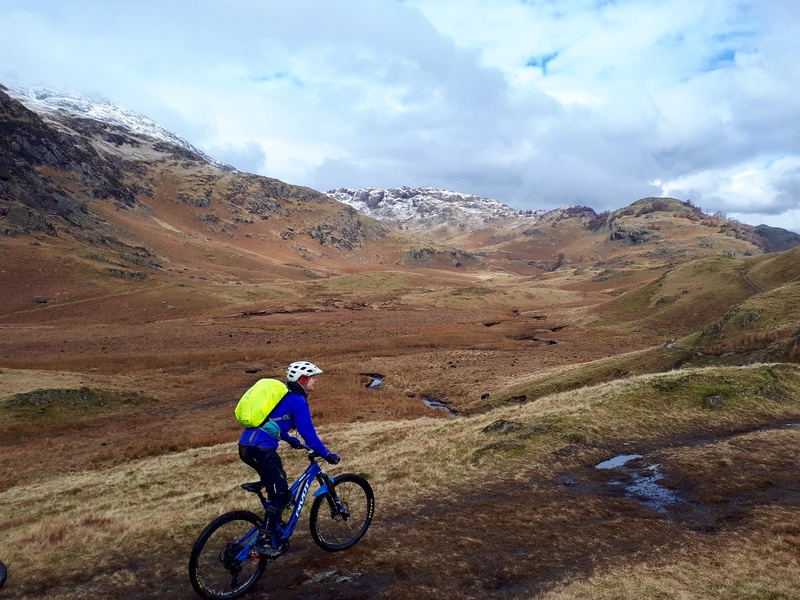 Ian joined us on Sunday for a ride westward over into Dunnerdale to explore the network of bridleways around that very pretty valley. Lots of ups and some suprisingly dry and interesting singletrack down into Dunnerdale were followed by a very steep road climb up Kiln Bank where we stopped to share the enormous sausage roll Steve had bought just after we set off. All six of us had a chunk so Steve set off again with a considerably lighter rucksack to begin the long and rocky descent down to Seathwaite. This was fun though the bottom section was a bit lumpy. The final climb up Walna Scar was mainly a push for me (rescued again by Steve and Alan who popped back a couple of times to take my bike for a bit) but we all eventually got to the wall halfway up so we could peel off right and head down the singletrack to Stephensons Ground. Next we found an excellent section of trail with a muddy bit in the middle that we navigated quite craftily followed by some fun and tricky rocky bits. Ian had an alarming over the bars moment but jumped up straight away so we all sailed past him. A last ride up the road that finished my legs off was followed by a speedy dash to the cafe for huge vanilla slices and three inch thick slabs of caramel shortbread; very filling but not very subtle. Judith still managed to unhinge her jaw and get a vanilla slice in whole. Overall another very enjoyable classic SOC mountain bike weekend away - lots of riding, eating and dominoes!